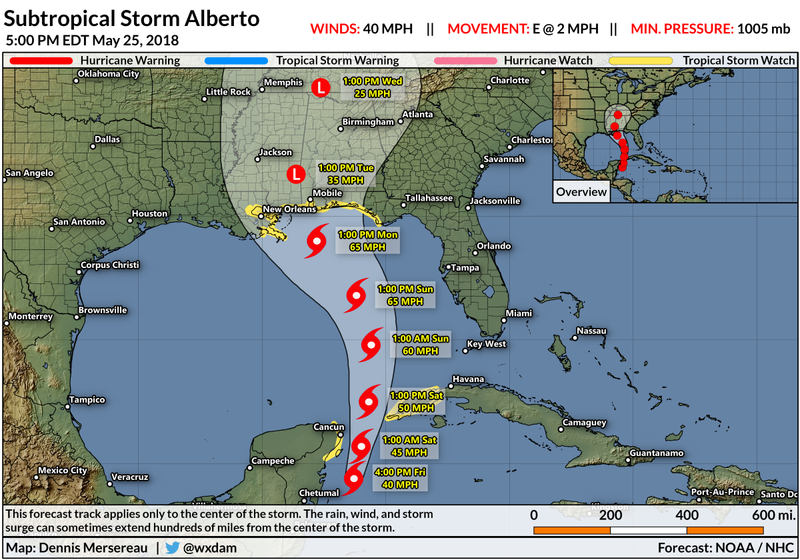 Tropical storm watches are now in effect for portions of the northern Gulf Coast ahead of Subtropical Storm Alberto's expected arrival on Monday. Forecasters expect the system to be a strong tropical storm by the time it makes landfall. While there's a chance that the storm could be near hurricane strength around landfall, the biggest story with this storm will be the rain. The 5:00 PM EDT advisory from the National Hurricane Center doesn't make many changes to the forecast beyond some fine-tuning of the track and the issuance of tropical storm watches. The watches are now in effect from Grand Isle, Louisiana, to Indian Pass, Florida, including the cities of New Orleans, Gulfport, Mobile, and Pensacola. These watches will likely be upgraded to warnings later this weekend. A tropical storm watch means that tropical storm conditions (sustained winds between 39 and 73 MPH) are possible within the next 48 hours. The onset of wind and rain will precede Alberto's landfall by a day or so. Rain from this system will begin across Florida tomorrow and Sunday, reaching inland parts of the southeast late Sunday through the first half of next week. A storm surge watch is also in effect from the mouth of the Mississippi River in Louisiana to Horseshoe Beach, Florida. A storm surge is water sea water pushed inland by strong, persistent winds. Storm surge inundation of 2-4 feet is possible in areas currently under the watch. 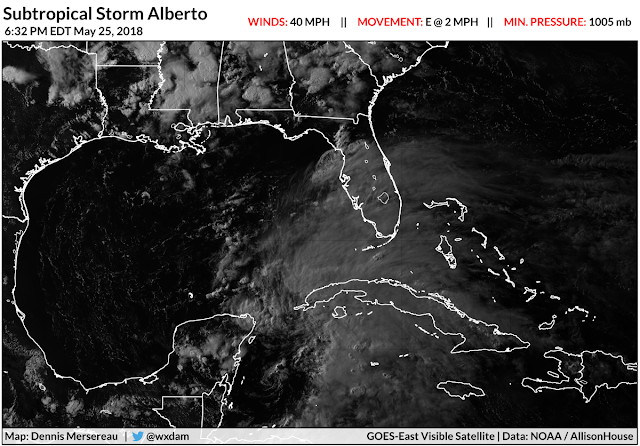 Alberto has that just-rolled-out-of-bed look to it on satellite imagery. The storm is quite disheveled as it battles wind shear and it has a ways to go before it organizes into a respectable-looking system. An Air Force Reserve Hurricane Hunter aircraft investigated the storm this afternoon and found that it remains a weak subtropical storm. A subtropical storm is one that contains characteristics of both a tropical and extratropical storm. In Alberto's case, the storm is pulling some of its energy from an upper-level trough rather than solely through thunderstorm activity around the low-pressure center at the surface. It should become fully tropical as it grows more organized over the next day or so. The storm is lopsided and it will likely remain that way for much of its life. The majority of the wind and heavy rain will occur along and to the east of the path of the center of circulation. The track is important in determining who sees the heaviest rain and the worst winds. Alberto is also a sizeable system and it will have widespread impacts across the southeast. 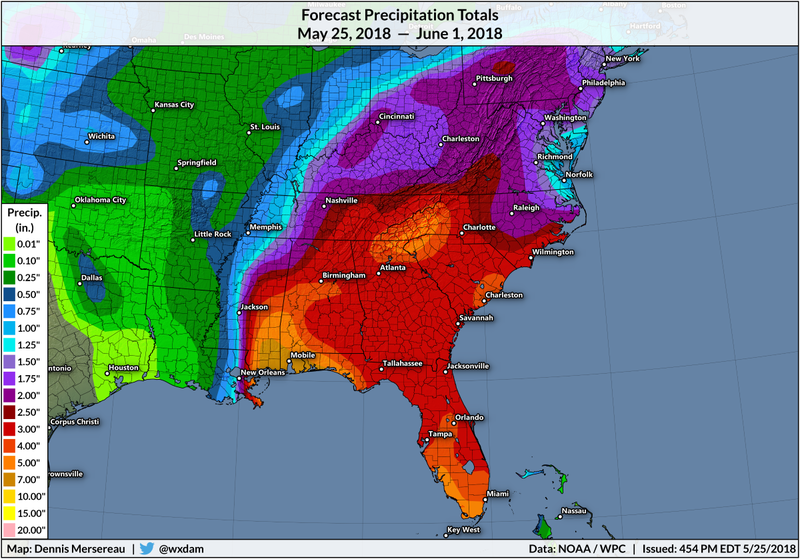 The Weather Prediction Center's updated rainfall forecast for the next seven days continues to show at least 3" of rain is possible across most of the southeastern United States, with the heaviest rain focused on Florida, Alabama, and Mississippi. There's now an area of 7"+ of rainfall predicted right around where the National Hurricane Center expects Alberto to make landfall. This bullseye will change as future forecasts adjust the predicted track as needed. 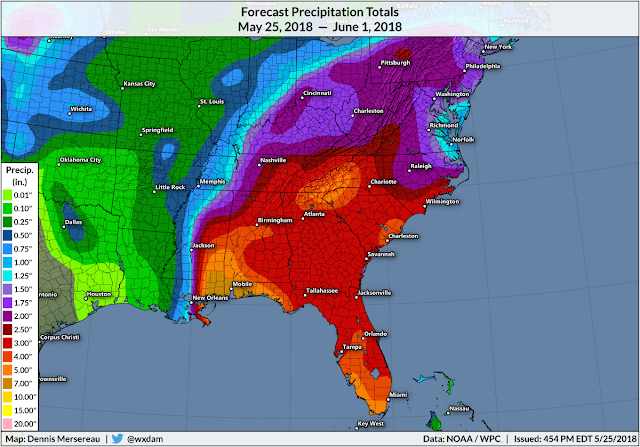 Flooding is likely across the southeast where heavy rains have fallen for the past couple of weeks. Flash flooding will be a problem with persistent bands of thunderstorms. While the rain is by far the greatest threat with Alberto, we can't discount the potential for wind damage, especially since the storm is expected be within shouting distance of hurricane strength by the time it makes landfall. Water in the northern Gulf of Mexico is abnormally warm for this time of the year, running between 79°F and 82°F. The combination of warm waters and lower wind shear should allow Alberto to strengthen as it slows down in the northern Gulf on Sunday and Monday. The only saving grace is that it looks like dry air will impinge on the storm's ability to organize and ramp itself up. If that doesn't happen, though, there's a chance Alberto could flirt with hurricane status if everything comes together just right. What can you do to prepare? The most important thing to do is to make sure you're prepared for power outages. Take stock of your ready-to-eat food—stuff like canned ravioli, Spam, breakfast bars, those tasty little cups of fruit—and keep some bottled water on hand in case there's a boil water advisory issued for your area and you can't, well, boil water. Batteries and battery-operated flashlights are a must. Your cell phone's flashlight is great in a pinch but keeping your phone charged is a must. Take a look around outside and tie up or bring in anything that could fall over or blow around in high winds. Trim tree branches and limbs away from your home if possible. If you have to drive during high winds or heavy rain, search out some alternate routes in case roads are covered by water or downed trees and power lines. It's the little things—easy food, a reliable flashlight, knowing an alternate route—that really help when you're faced with a storm and you haven't had much time to think and prepare for the season. The next full update from the NHC comes out at 11:00 PM. We'll know more about exactly who will see the worst of the storm tomorrow and certainly by Sunday.